A busy schedule is no reason to miss your workout. This quick circuit training can easily fit into your daily plan – so no excuses and get down to work! This workout consists of 3 circuits with active rests at the end of each circuit. For this, use a jumping rope or any other cardio machine. No rest between exercises! Warm up your arms and shoulders for 5 minutes before the main workout. Start off sitting on a lat pull down machine, grabbing wide the handles with an overhand grip, keeping your knees positioned underneath the padding and feet flat on the floor. Once in position, slowly pull down on the handles and bring them down towards your sides, and squeeze with your lat and back muscles. Hold for a count then return back up to the starting position. Start off by attaching a v-bar to a pull down pulley cable machine and stand upright with your abs drawn in tightly, grabbing onto the bar. Pull the bar straight down in a controlled manner until it touches the front of your thighs. Hold for a count and then slowly return the bar to starting position. Note: Keep your upper arms next to your torso and work only with the forearms. Start off sitting down at a pull-down machine and place your knees underneath the padding on the machine. Grab onto the bar with a close overhand grip and pull the bar down straight until it is even with your upper chest. Once in the final position hold for a count while squeezing the lat muscles and then slowly return back to the starting position. Start off by loading up a weighted barbell or EZ bar with the weight that you would like to perform for this exercise. Lie down on the bench. Grab the bar, lift it above your head, then slowly while keeping your elbows close to your body, lower the weight behind your head while squeezing your triceps and hold for a count. Start off by standing in front of a low pulley cable machine and grabbing onto a narrow grip. Keep your knees bent and shoulder width apart then slowly pull the bar back, making sure that your elbows bend in towards the sides as you bring the bar in to your pecs. Hold this position for a few seconds then return back to the starting position. Start off facing a high pulley cable machine with either a rope or dual handles connected to the machine. Grab onto the handles and pull the weight directly towards your face, using your shoulders, and separating your shoulders as you pull the weights back. Hold for a count then return back to the starting position. Start off seated on the end of a flat bench with feet on the floor in front of you holding a dumbbell in each hand. Slowly, while using your thighs, raise the dumbbells to shoulder level and twist your palms so that they are facing in towards your body. From there raise one dumbbell above your head, while keeping the other one still, squeezing in your shoulder, and hold for a count. Return back to the starting position and repeat 12-15 times. Start off standing with your feet shoulder width apart, your knees slightly bent and your abs drawn in. Grab a barbell with an underhand (palms up) grip as wide as your comfortably can and extend your arms fully against your thighs. Keeping your elbows straight, raise the bar towards your chest till your forearms touch your chest, squeezing your bicep muscle. Pause for moment and then return to the starting position. Start off standing up straight with your feet shoulder width apart and holding a dumbbell in each hand. While keeping your body still, slowly raise one of the dumbbells out to the side up to shoulder level, squeezing on the way up and hold for a count. Then return back to the starting position and repeat with the opposite arm. Start off standing with your feet shoulder-width apart, keeping your knees slightly bent and your abs tight in. Grab a dumbbell in each hand with your palms facing in, extend your arms so that they are at the sides of your body and keep your elbows locked as this will be your starting position. Slowly lift your arms up in an arc towards your shoulders, isolating your biceps and continue until you reach the top position. Hold for a count then return back to the starting position and repeat 12-15 reps.
To begin this exercise; start off lying face down on an incline bench with a dumbbell in each hand rested on the floor in front of you. Then raise your arms so that they are parallel with your shoulders and hold onto this position for a few seconds. Make sure that you are squeezing both your shoulders and back throughout the motion. 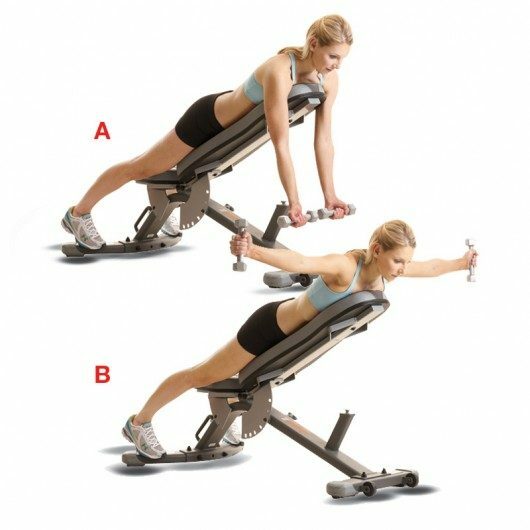 Start off by attaching a short bar to a cable pulley at the bottom of the machine then stand with your feet shoulder width apart, abs tight and knees bent slightly. Grab the bar with a close underhand grip, lower your arms down towards your thighs and then, by bending through your elbows, raise the bar up towards your upper chest. Once at the top position, squeeze your biceps and hold for a count. Grab a jumping rope and jump for 5 minutes. If you prefer some other cardio machine, try Stair Master, Treadmill or Biking. Then do another 2 circuits with the same 5 minute active rests in-between the circuits. If you have only 5-10 free minutes in your schedule, you’ll like our 5 Minute Fat Shredding Workout and no equipment needed!